Back in September, Navegate was charged with the task of transporting a 98,000-lb. boiler tank. Its journey began in Fontana, CA, and when Navegate’s transportation specialists got their first glimpse, they became visibly giddy. 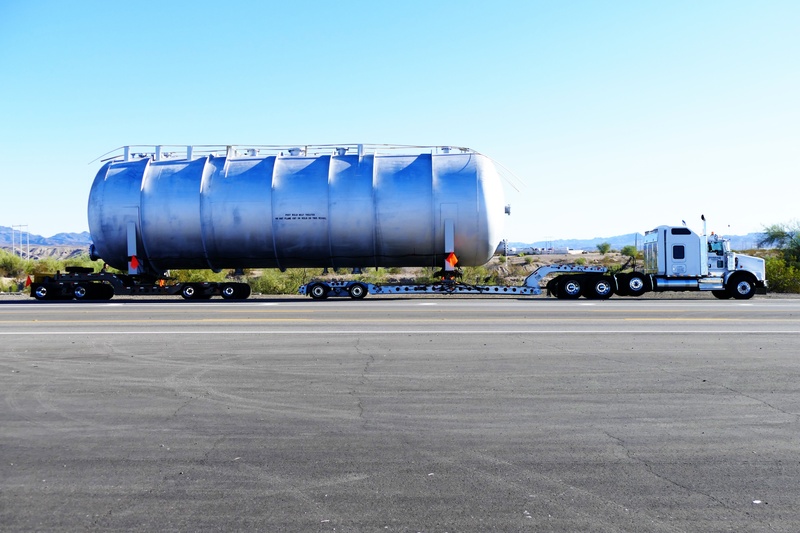 Having planned for its arrival for weeks, the operation was designed to ensure the smoothest trip possible for this hollow giant as it makes its way through southern California, Arizona, New Mexico, and eventually, to Houston, TX. From there, it will be passed on and shipped to its final port destination in Japan. “This is the kind of challenge that gets us excited,” beamed Navegate’s L.A. Branch Manager, David Burnett, “There is an almost logistical art to moving big awkward things like this.” The nine-day, 1,600-mile transport was, in fact, quite an operation. The tank, requiring two semi chassis attached end-to-end, sitting almost as wide as two trucks, and taller than if they were stacked on top of one another, doesn’t exactly fit through average roadways without a hitch. Simply moving an object of this size across the southwestern U.S. can cost upwards of $30,000 to $50,000 and weeks’ worth of permit applications, special permissions, and route planning. The routes required to accommodate something that’s the size of a solid-rocket booster can often double or triple standard travel time, requiring crews to route around low bridges, narrow roads, and sometimes entire states. Certain states and regions choose not to allow oversized loads at certain times of day or week, or require special equipment. For cargo as large as this, entire roads needed to be shut down, stoplights and road signs were removed, and finding a place to fill up for gas was nearly impossible. 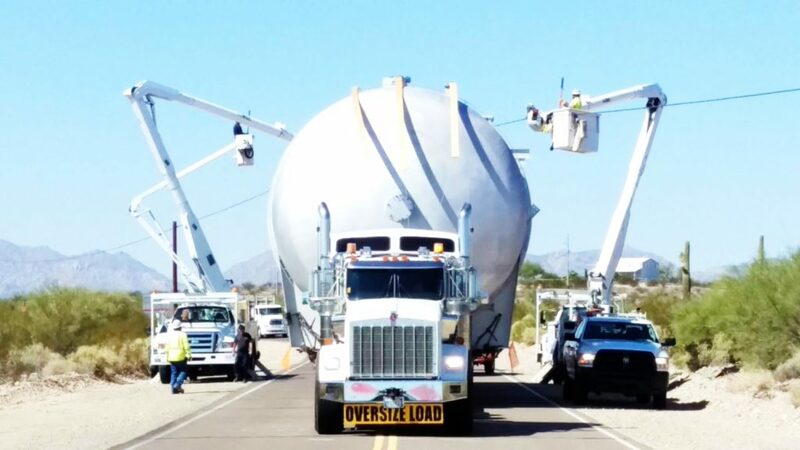 Our giant boiler tank was accompanied on its journey by electrical crews who lifted wires and cables out of the way and police escorts to ensure that roadways were clear to make way for the massive hunk of metal. Navegate’s Director of Flatbed Services, Mark Melzarek, explains the art in saying, “it’s not so much about knowing, as it is understanding. You need to understand what you’re moving, and how it’s moving, if you are to really solve the problem. No shipment like this will ever be routine.” Transporters need to be able to anticipate obstacle after obstacle, in addition to any unexpected crises that may arise. Unfortunately, when dealing with things this large (and round) trucks can tip, straps can break, and mother nature can wreak her havoc. The experience and understanding that Navegate’s experts provide allowed a smooth, easy ride to Texas for our big friend. Despite the excessive planning and work required, Navegate was overwhelmingly excited to be a part of the boiler tank’s journey. Transporting big, awkward things is their art, and they geek out over it. Melzarek explains why Navegate’s team is so good at what they do in saying, “it’s all about pain relief. All I really do is take problems and make them hurt a little less for people.” Whether you need an industrial fan moved to a neighboring state or a 98,000-lb. boiler tank transported across the country, Navegate will be happy to get to work and relieve your pain. Figuring out the puzzle that is transporting big, awkward things is what makes us get out of bed every morning.